"COSCO Outdoor Living’s Traditional 3 Piece Small Space Bistro Patio Set is the perfect choice for compact outdoor spaces. Its small size and traditional classic white silhouette allows for placement on any balcony or terrace. Featuring two folding chairs, this set is easy to store in a garage when not in use. The table top and seat pans feature a flower stamped decoration to add a unique touch. 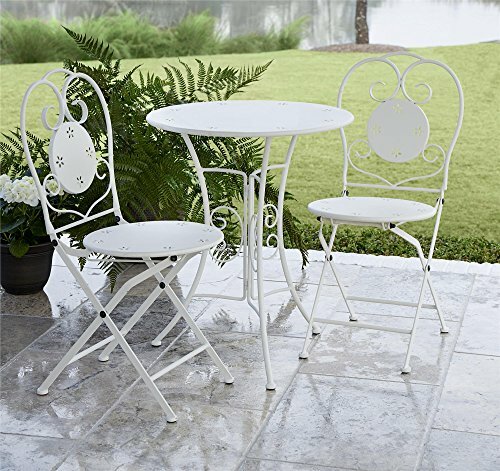 Constructed of steel and a durable outdoor powder coat, this bistro set is weather resistant for outdoor use. Enjoy this small space bistro for a quiet moment with a beverage or book. The COSCO INTELLIFIT collection of durable and affordable outdoor furniture folds, stacks, and nests to fit your space – no matter the size. From your backyard to your balcony, INTELLIFIT outdoor furniture enhances your home with space saving and price conscious practicality. COSCO Outdoor Living, a brand of COSCO Products, offers space saving folding groups to roomy conversation and dining sets, designed to meet all your outdoor patio needs. Our collections help create your own outdoor lounging spaces or cozy living areas on your patio or deck. Our outdoor products are designed with form and function in mind to help you create the outdoor space you dream of. Design aspects for COSCO Outdoor Living products include innovation, style, and elegance to suit any customer’s home décor or design motif. Manufactured with durable, weather-resistant materials, our furniture is built to last and to impress. We offer different color options on multiple sets, making it easy to fit your personal taste. We invite you to sit back, relax and enjoy your COSCO Outdoor Living furniture." View More In Patio Furniture Sets.